In 1916, Emma O’Neill is frozen in time. After sampling an experimental polio vaccine brewed on a remote island off St. Augustine, Florida, she and her family stop aging—as do the Ryans, her family’s business partners. In a way, this suits Emma fine because she’s in love with Charlie Ryan. Being seventeen forever with him is a dream. But soon a group of religious fanatics, the Church of Light, takes note. Drinking the elixir has made the O’Neills and Ryans impervious to aging, but not to murder—Emma and Charlie are the only ones who escape with their lives. On the run, Emma is tragically separated from Charlie. For the next hundred years, she plays a cat-and-mouse game with the founding members of the Church of Light and their descendants. Over the years, a series of murders—whose victims all bear more than a passing resemblance to her—indicate that her enemies are closing in. Yet as the danger grows, so does Emma’s hope for finding the boy she’s certain is still out there . . .
Joy Preble lives in Houston with her family. She teaches and lectures widely on writing and literacy, and is the author of the Sweet Dead Life series, the Dreaming Anastasia series, and Finding Paris. Visit her online at joypreble.com or follow her on Twitter @joypreble. "Epic and addictive—a story with the soul of a romance and the pacing of a thriller." "A high-speed love story with an electric mystery at its center. Immortality hasn't been this haunting, romantic, and thrilling in a long time." 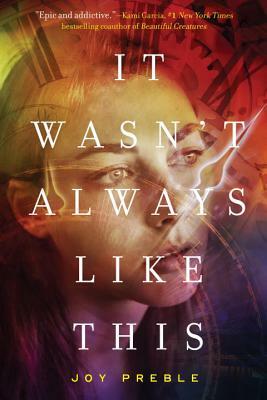 "Immortality, first love, murder, and mystery come together in It Wasn't Always Like This, an electrifying young adult novel." "A thrilling tale of a fountain of youth, a murderous Church of Light and Emma O’Neill and Charlie Ryan, in love and eternally 17, forced to separate and stay on the run . . . [A] great summer read." "Preble adeptly weaves together snippets of Emma's past and present, gradually outlining her transformation from an optimistic, winsome teen to a hardened, lone-wolf type, albeit one whose heart still flutters for a certain eternal boy . . . [Readers] will be equally charmed by Emma's noir-inflected narrative and her decades-long romance." "A captivating plot with some twists, an aura of time travel, and an array of vivid settings . . . [Readers] who relished the classic Tuck Everlasting by Natalie Babbitt will revel in this tale." "[Captures] the loneliness, isolation, and even regret that accompanies the secrecy required by eternal youth . . . A modern Tuck Everlasting with a thriller twist." "Part paranormal mystery and romance with a strong female character searching for her long lost love." "While the murder mystery keeps readers hooked, the longing and heartache of Emma’s circumstances makes the fantasy feel very realistic, and together, these elements weave a strikingly gripping and enjoyable tale." "With its exciting plot and well-wrought characters, this novel emerges as a suspenseful treat with a gooey romantic center. The narrative alternates between scenes of Emma’s distant past with Charlie and her murder-mystery present, building to a final showdown that is both surprising and satisfying."